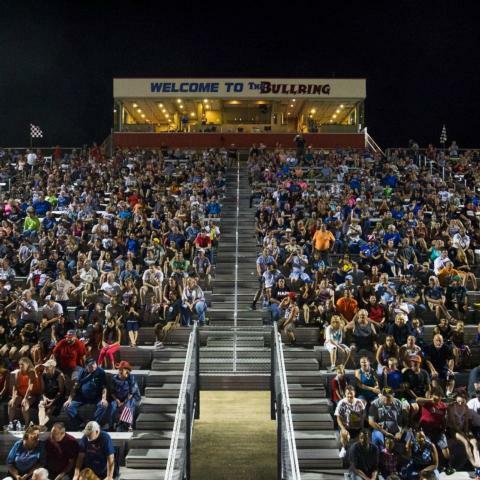 Race fans, you can enjoy local stock car racing every other weekend from mid-March through November at The Bullring, Las Vegas Motor Speedway's 3/8-mile paved oval track located off Las Vegas Blvd., inside gate Entry 2! Four classes of NASCAR Whelen All-American Series racing, including Super Late Models, a trio of USLCI divisions and even some specialty divisions like Jr. Late Models and Skid Plate Cars compete at the track on a regular basis. 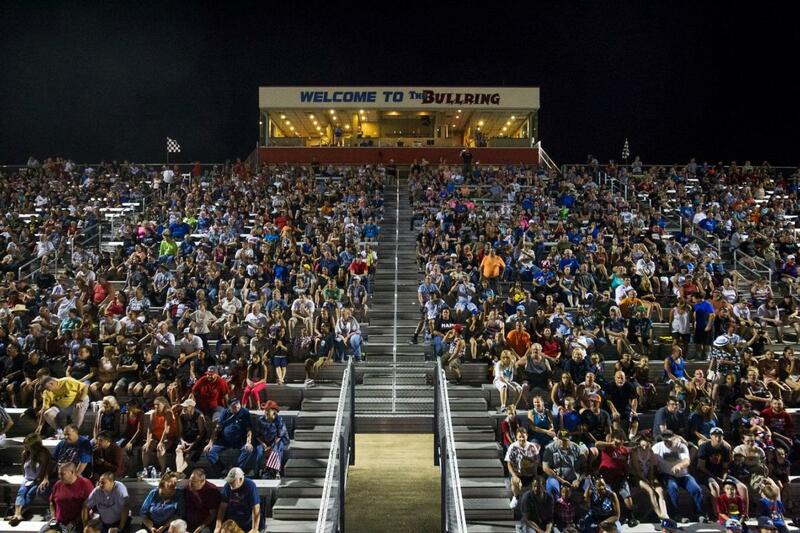 The Bullring is also host to regional series like the Lucas Oil Modified Series, SPEARS Southwest Tour Series, USAC HPD Midget Series and the Southwest Tour Trucks to give fans some regional racing flavor. Theme nights like Hometown Heroes Night, Military and Veterans Appreciation Night and the wildly popular Fourth of July celebration, the Night of Fire, add extra allure to the popular race track throughout the year. *All active-duty military personnel and veterans with valid IDs will be given free admission to the night's races. NASCAR Super Late Models (Twin 35s), Super Stocks, Bombers and 602 Modifieds, USLCI Legends and Bandoleros, Skid Plate Cars and Jr. Late Models; Fans will be treated to a pre-race autograph session on the track before racing begins, and The Bullring will pay tribute to late Bullring racer Chris Trickle during opening ceremonies. NASCAR Super Late Models, Super Stocks, Bombers and 602 Modifieds, USLCI Legends and Bandoleros and Skid Plate Cars (Thunder Cars Race No. 5 on Friday night); All area students, faculty and staff will be admitted for free with a valid school ID. NASCAR Super Late Models, Super Stocks, Bombers and 602 Modifieds, Late Model Truck Series, USLCI Legends and Bandoleros and the final Jr. Late Models points race of the season; This event will feature greatly reduced ticket prices as we try to pack the track! Season points championships will be decided for NASCAR Super Late Models, Super Stocks, Bombers and 602 Modifieds, as well as USLCI Legends and Bandoleros and Skid Plate Cars (Thunder Cars points title decided on Friday night); The Southwest Tour Trucks also will be in town on the special night! How do I get to The Bullring? From I-15 North - Take I-15 North to Exit 54 (Speedway Blvd). Take your first right at Hollywood Blvd. and proceed to Las Vegas Blvd. North. Make a left at Las Vegas Blvd. North until you get to Entry 2. Proceed left through Entry 2. From Las Vegas Boulevard North - Proceed on Las Vegas Blvd. North to Entry 2. Proceed left through Entry 2. Where do I purchase tickets for The Bullring, and how much are they? You can buy Bullring tickets at the Las Vegas Motor Speedway Ticket Office (located in the Ticket/Gift Shop building off Speedway Blvd.) or by calling 1-800-644-4444. Tickets may also be purchased online via Ticketmaster. If you have purchased tickets in advance but did not have them mailed, you may pick them up at the LVMS ticket office until the day of the event. The Bullring will call window is located at The Bullring. The credentials trailer is located directly inside Entry 2 on the righthand side. This area is for racers, team members, pit passes and credentials only. Tickets for the event are not sold or held here for spectators. Can I bring alcoholic beverages into to The Bullring? No outside alcoholic beverages may be brought into the gates. Spots in the Stockyard area, located behind Turns 3 and 4, are available for purchase and allow tailgating. Check our website, for driver autograph opportunities at Bullring events. Is there an ATM machine at The Bullring? Yes, there is an ATM machine located next to the concession building behind the grandstands. Las Vegas Motor Speedway seeks to provide reasonable accommodations for all qualified individuals with disabilities. Please contact the ticket office at (800) 644-4444. What items are prohibited at the Bullring? Saturday night main events with gates opening at 5 p.m. The ticket sales windows are located directly at the main gate entrance of "The Bullring" Track. Ticket Sales opens at least half an hour prior to the gate open time for the event. All tickets are General Admission Sales. We have discount pricing for Military, Senior and Family 4 packs, and children age 12 and under are admitted free with a ticketed adult. Advance ticket prices are available up to one day prior to the event. All tickets purchased in advance through our website or Ticket Services will be held at Will Call unless otherwise stated by our representative. Please bring your ID to the ticket sales window, the credit card you used for purchase and one of our associates will print your tickets off for you. The credentials trailer is located directly inside gate 2 on the right hand side. This area is for racers, team members, pit passes and media credentials. Tickets for the event are not sold or held here for spectators. You would need to go to Ticket Sales for general admission to the event. The Bullring Stockyard is open to customers who would like to tailgate along turns 3 and 4. This area can be accessed by following the fence line from the main entrance up and behind the go kart track. There will be a customer service representative there with a list of spaces that are available. One stockyard space comes with 4 general admission tickets. Stockyard Will Call will be located in this area as well. Golf carts, quads, scooters, and/or dirt bikes are strictly prohibited on LVMS property. These items will be impounded immediately upon detection. One-(1) EZ-Up style shade shelter per space is permitted (10' x 10'), provided the shelter is securely fastened to the ground and RV and fits inside your assigned space. Side curtains, awnings and/or banners that block the line of sight of your neighbors are prohibited. Please observe the yellow line on the ground. No vehicles, tents or awnings can be located between the fence and the yellow line. This policy is in place to honor sight lines for all stockyard occupants. Please keep the area between the chain link fence and the yellow line clear of vehicles and other items that will interfere with sight lines. Fans are welcome to place chairs, grills and tables in this area. Just do not put up large items that can obstruct views. In the interest of safety, LVMS reserves the right to have all structures removed if wind speed exceeds 15m.p.h. Camping tents and/or party rental tents are not permitted. As a courtesy of your stockyard neighbors, please do not play loud music that will interfere with the public address speakers and/or public address radio broadcast. Scaffolding and/or mechanical lifts of any type are prohibited. Custom-built RV roof platforms are not permitted. You and your guests are only permitted inside the confines of your stockyard space. Respect the people next to you and stay out of their area. People found to be overcrowding their space and violating the space of their neighbors will be asked to leave. Glass bottles are strictly prohibited and subject to confiscation by Las Vegas Motor Speedway Security. Coolers are not permitted unless in the Stockyard area and are subject to search. Kegs are prohibited. All food and beverage from the stockyard area must remain in the stockyard. Please do not take food and beverage from stockyard into the grandstand area. Firearms, fireworks, and weapons of any type are not permitted. Violators are subject to arrest. Solicitation of any type is not permitted on LVMS property. Sale of food, beverages, souvenirs or merchandise is strictly prohibited. No flashing lights on RV's or flagpoles. Flagpoles must be securely attached to your vehicle. All vehicles are subject to search at anytime. LVMS is not responsible for lost, damaged or stolen property. At no time is it permissible to connect any electrical cords to the LVMS generators supplying power for light towers or other electrical equipment necessary to provide for the safety of LVMS patrons. Anyone found to tamper with LVMS stockyard speakers, lights, fences, etc. will be asked to leave. All vehicles must vacate the stockyard 30 minutes after the conclusion of the last event of the evening. Management reserves the right to sell a reserved space if it is not occupied by 7:30 pm the night of the event. LVMS management reserves all rights. U.L. approved, fully enclosed cooking pits are permitted. Open fires and/or barrel fires are not permitted. A fire extinguisher within easy reach is required. Flammable substances are not permitted within 20 feet of a fire. Do not ever leave a fire unattended. LVMS owns and controls all rights to space locations for all events at the track. This pass is a temporary license for the space and time period that is printed on the pass. This permit licenses the holder to park one vehicle in the assigned area for the event specified. Commercial activities of any kind are prohibited without prior written permission of Speedway Motorsports, Inc., or Las Vegas Motor Speedway. Park at your own risk; SMI/LVMS and their officers, agents, employees and affiliates are not liable for any loss of any kind to vehicle or other property of permit holder. Acceptance of this permit constitutes acknowledgement by holder that he or she has read and consents to the terms hereof. *Not all divisions compete on each event night. Chris Clyne 153 points; 2. Scott Gafforini 127; 3. David Anderson 116; 4. Johnny Spilotro 115; 5. Steve Anderson 104; 6. Kayli Barker 79; 7. Matt Frady 76; 8. Darin Callaway 71; 9. (tie) Tyler Fabozzi and Charlie Pike 48; 11. Luke Hall 25; 12. Donna Gunther 21. Kyle Jacks 111 points; 2. Vinny Raucci Jr. 104; 3. Michael Miller 93; 4. Anthony Mann 81; 5. Adam Simon 79; 6. Jacob Quartaro 73; 7. Tim Maserang 72; 8. Carl Duryee 66; 9. Tia Guy 64; 10. Matthew Cunningham Jr. 61; 11. Kirk Hance 54; 12. Steve Durbin 43; 13. Trista Vanderploeg 41; 14. Steve Dewey 40; 15. Aaron McMorran 25; 16. Michael Durbin 24; 17. Pete Meyer 1. Doug Hamm 105 points; 2. Brian Reed 97; 3. Ron Reed 86; 4. Zachery Nicholls 83; 5. Pat Petrie 80; 6. Mason Sargent 77; 7. Mark Allison 75; 8. Kyle Keller 73; 9. Court Connell 68; 10. Tom Pfundstein 66; 11. Jimmy Petrie 64; 12. (tie) Dan Root Jr. and Jason Kiser 63; 14. Jason Irwin 18. Sam Jacks 117 points; 2. Ethan DeGuevara 95; 3. Camden Larsen 92; 4. Jim Merlino 82; 5. Matt Larsen 65; 6. Donna Gunther 27; 7. Noah Morris 26; 8. Kyle Jacks 1. Jaron Giannini 102 points; 2. Dylan Fabozzi 92; 3. Branden Giannini 80; 4. Jason Irwin 78; 5. Brian Williams 72; 6. John Hans 71; 7. Jordan Holloway 69; 8. Cody Brown 60; 9. Jonathan Mawhinney 55; 10. Amilleo Thomson 54; 11. Gary Wegener 51; 12. Tanner Reif 45; 13. Bruce Silver 43; 14. Peyton Saxton 42; 15. Tyler Reif 41; 16. Bradley Ericson 39; 17. Enzo Lalama 37; 18. Jeff Regier 34; 19. (tie) Braden Rogers and Dezel West 31; 21. Jake Bollman 27; 22. Andy Hulcy 22; 23. Greg Benson 16. (tie) Dennis Dowell and Cindy Clark 64 points; 3. Scott Stockwell 62; 4. Ben Williams 55; 5. John Petsco 51; 6. Robert Leany 50; 7. T.J. Cotter 45; 8. John Whitaker 43; 9. William Good 28; 10. Larry Dowell 25; 11. Tyler Christensen 24; 12. Matt Esposito 23; 13. Fred Droegemueller 20. Jaden Walbridge 74 points; 2. R.J. Smotherman 71; 3. Braden Connor 60; 4. (tie) Aiden Murphy, Hailey Liles and Olivia Manke 52; 7. Jaron Giannini 30; 8. Alex Eskandari 29. Chloe Lynch 113 points; 2. Landon Gresser 104; 3. Brendan Tracy 93; 4. Owen Romzek 89; 5. Haylee Morris 81; 6. Katie Crouch 77; 7. Skyler Meisenbach 26. Sabastian Lafia 102 points; 2. Ashton Leonard 86; 3. (tie) James Starcher and Max Romzek 83; 5. Alexis Bjork 82; 6. Logan Gresser 78; 7. A.J. Blackwill 71; 8. Kyle Crouch 50; 8. Tuscan Nuccitelli 68; 9. Kyle Crouch 50; 10. Hank Hall 39; 11. Jeffrey Erickson 31. Chris Bosley 78 points; 2. Doug Germano 68. 14 Darren Rollins, Larry Dittman, Austin Murphy, Mark Schottmuller, Mike Cofer, Noah Gragson, Vinny Raucci Jr.
*Minimum of 10 career Saturday night feature victories since 2000. Updated Saturday, April 20, 2019. *Minimum of two season titles. *Track records reflect best times recorded with tires that are currently used at The Bullring.